Meticulously groomed cross-country trails twist through the forest and alongside Lake Wenatchee and its river. Loops range from 0.5-2 miles. A Discover Pass ($10/day or $30/year) is required to park, and a Sno-Park Permit ($20/day or $40/all season) is required to use the trails. Want to spend a day gliding over meticulously groomed cross-country ski trails only a two hour drive outside of Seattle? 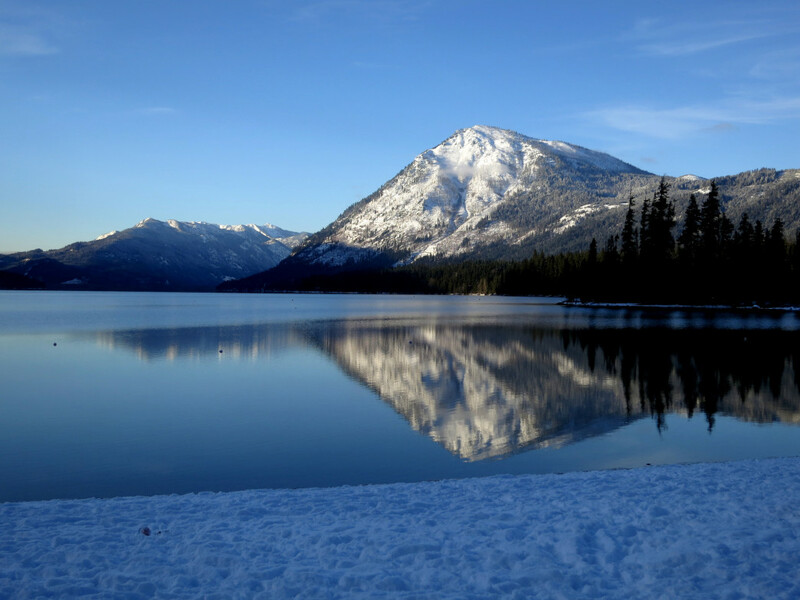 Then a wintertime visit to Lake Wenatchee State Park is for you. The 489-acre park has more than twenty-five miles of winding cross-country ski trails that will satisfy everyone from seniors and children looking for flat, gentle trails, to skate skiers looking for a hardy workout. Thanks to Washington State Park’s Sno-Park program, Lake Wenatchee is an easily accessible way to get out in winter. With the variety of trials, and possibilities to venture beyond the park, there’s guaranteed to be something for everyone. Located just outside of Leavenworth (on the other side of the Cascades from Seattle – so make sure your car is prepared to brave Snoqualmie Pass), the park sits within the Wenatchee National Forest. The focal point of the park is, of course, the glacial fed Lake Wenatchee itself and the Wenatchee River. The lake and river bisect the park into two distinct parts: the north park and the south park. The south park’s cross-country tracks are part of the trial system that is maintained by Washington State Parks. It offers a series of 0.5-2 mile loops, as well as longer runs along the lakeshore, through forests of douglas firs, hemlocks, and ponderosa pines, and through the golf course, and along Nason Ridge. These trails are typically groomed Thursday through Monday. The south park also includes a family-friendly sledding hill, dog-sledding runs, and winter camping near the beach. The less-traveled and less-developed north park has about 3.3 miles of trails that follow the river and lakeshores. These trails are also groomed Thursday through Monday, into a double-track with a mini (5.5-foot) skate lane. Both the south and north areas also have snowshoeing trails. For those looking for more of a challenge, the ungroomed Nason Ridge backcountry is accessible from the south park. From the top of the ridge, you’ll be able to take in stunning views of Lake Wenatchee and the valley below. Families who want to get out of the city for a fun weekend trip. There are two different parking lots: one for the north park and one for the south. The latter is about one mile south of the north lot on highway 207 (both are well marked). A Discover Pass ($10/day or $30/year) is required to park at the Sno-Park, and a Sno-Park Permit ($20/day or $40/all season) is required to use the trails. Both are available online or from the automated pay station in the parking lot.